This is the full version of the 2017 Software Development Salary Survey. A downloadable edition is also available. 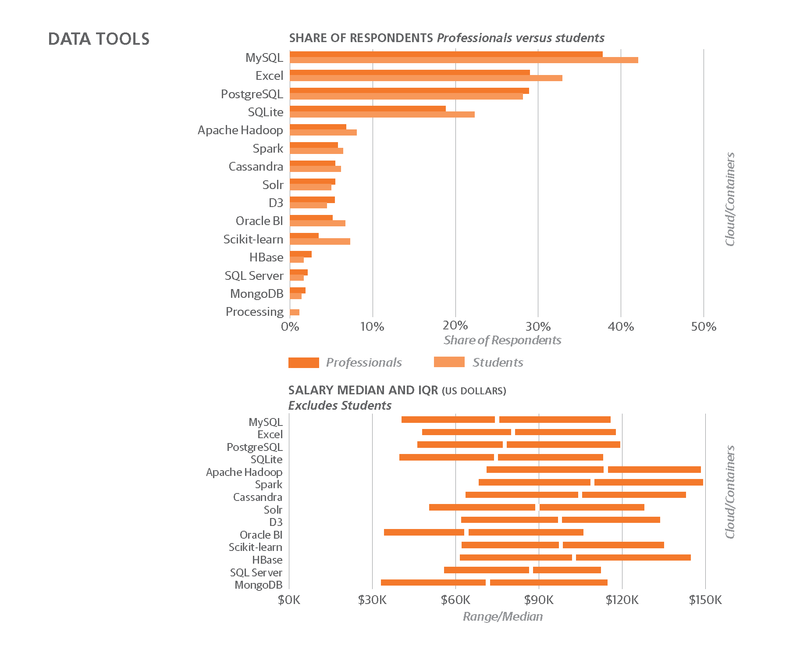 THIS REPORT EXPLORES THE LANDSCAPE of the professionals working in all facets of software development, including details about the relationship between roles, location, company size, industry, and earnings. The results are based on more than 6,800 responses collected via an online survey. We paid special attention to the variables that correlate with salary, but it’s not just about money: we also analyzed what tools, tasks, and organizational processes respondents most commonly use. In this, our second annual Software Development Salary Survey, we find some consistency in what matters to software developers. Much like last year, our results show that the better-paying jobs tend to concentrate in tech centers, that experience matters more than age, and that knowing more tools, working with more people in a wider variety of roles, and working for larger organizations all correlate with higher wages. And, the data shows that knowing when to hold ’em and when to fold ’em (i.e., self-reported good negotiating skills) might be a key to higher salaries. The median salary this year was down worldwide compared to last year, likely caused by a drop in the share of highly paid US-based respondents and a currency exchange-based decline for Western Europeans who made up a larger share of survey participants compared to last year. US respondents, particularly those in California, report the highest salaries. The larger the company, the higher the reported salaries (the small cohort of one-person organization is an exception, with reported salaries higher than respondents at organizations with less than 1,000 employees). 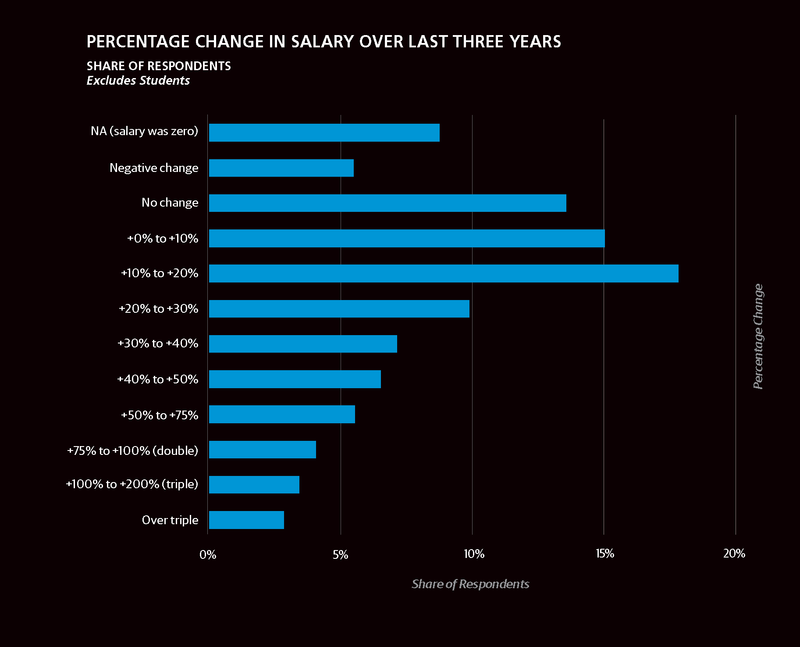 Compared to last year, there was no real salary change for respondents working at large companies. Software industry respondents (by far the largest share of survey participants) and consultants reported the lowest median income. Those self-reporting a high level of negotiating and bargaining skills also reported the highest median incomes. As with the other salary surveys we’ve run, those attending the most meetings—a proxy for higher levels of responsibility—report the highest incomes. We hope that you will find the information in this report useful. If you can spare 5–10 minutes, go take the survey yourself: http://oreilly.com/programming/2018-programming-salary-survey.html. You can download last year’s survey from http://oreilly.com/ideas/2016-software-development-salary-survey-report. 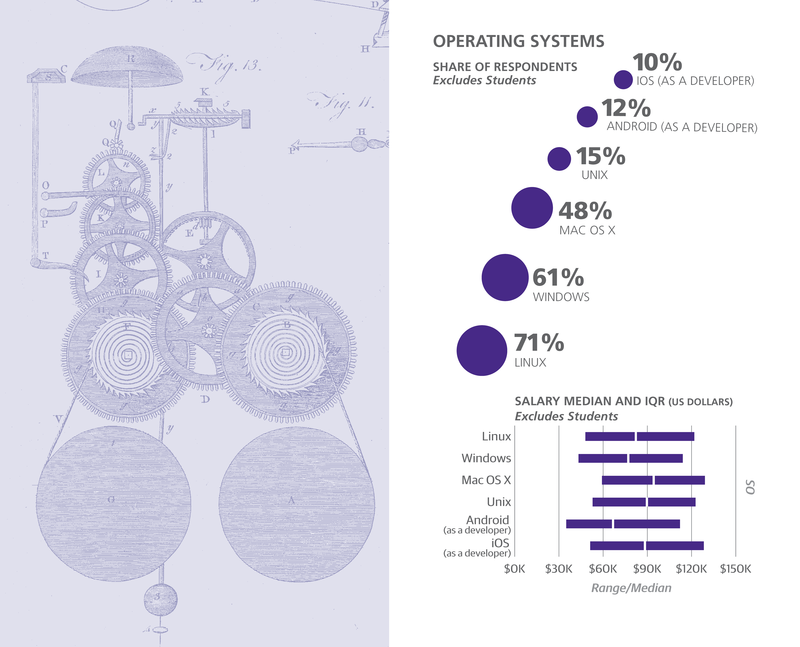 THE RESULTS FROM O’REILLY’S SECOND ANNUAL SOFTWARE DEVELOPMENT SALARY SURVEY ARE IN. This anonymous online survey ran last fall and winter and attracted more than 6,800 programmers, tech leads, managers, and students—an increase of more than 1,000 respondents compared to 2016. The respondents were from 110 countries, including all 50 US states and the District of Columbia. Use data from the report to compare yourself to others at similar companies and positions, and find out what roles, tools, work styles, organizational skills, and work environments correlate with the highest salaries. If you are looking to change jobs, about to have your annual employee review, or moving to a new town, this report will help you benchmark your skills and salary expectations. You’ll learn where you fit and how you might leverage these potentially career-changing findings. When calculating salary values, we omitted responses from people who identified themselves as students (about 6.5% of respondents) to offset the negative skew on reported earnings from those trying to balance part-time or full-time work with their academic load. 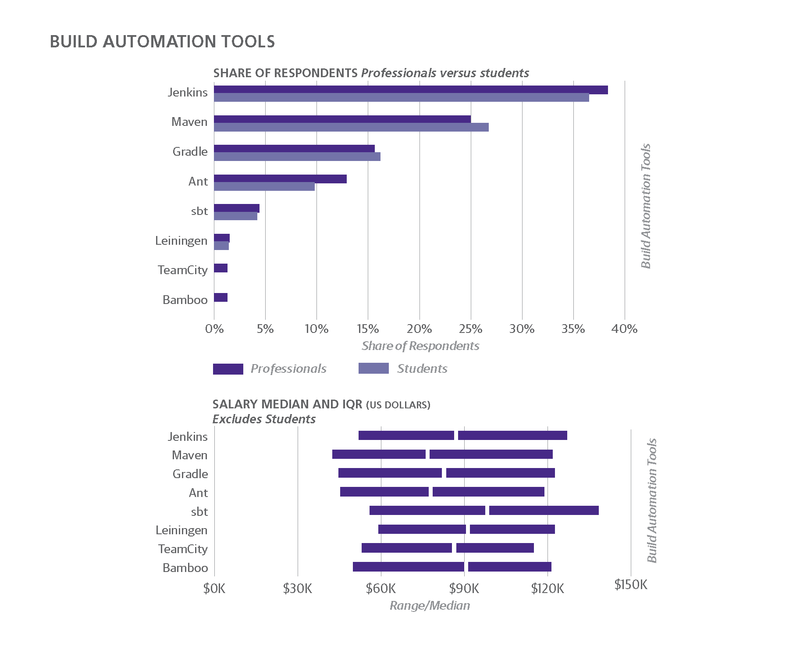 All salary numbers in this report exclude students, but student responses are used in some charts to compare skills and tools used by students versus professionals. US respondents report much higher median salaries than the rest of the world: $115K in 2017, up about 5% over 2016. The share of US respondents dropped from 61% to 46% of our total. Western European respondents reported lower salaries ($58K), nearly 7% lower than what was reported last year. European salaries were effectively reduced by the rising value of the US Dollar compared to the British Pound (up 16%) and Euro (up 8%) compared to 2016. The share of Western European respondents increased from 20% to 26%. 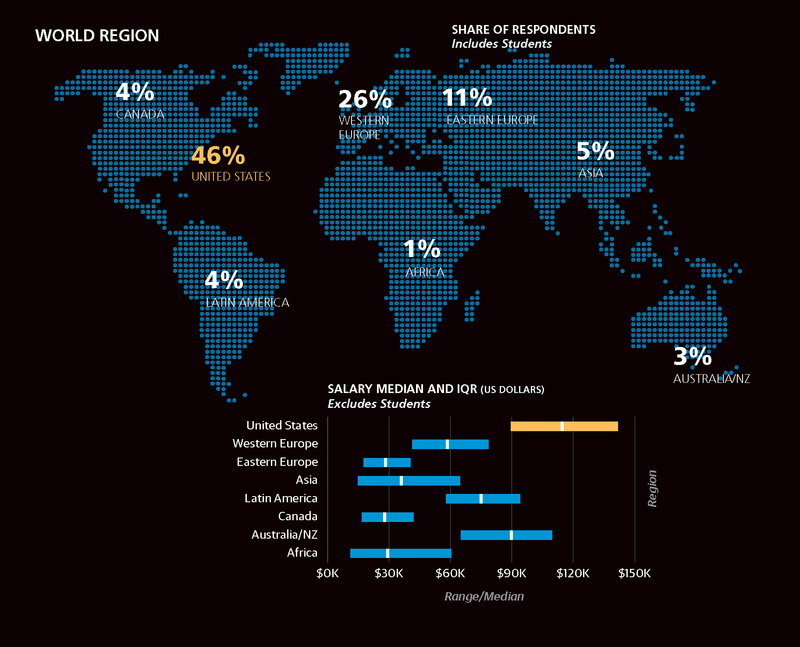 US respondents report much higher median salaries than the rest of the world. Countries with varying supply and demand conditions, different healthcare and tax regimes, volatile exchange rates, and other factors all make comparing salaries worldwide difficult at best. 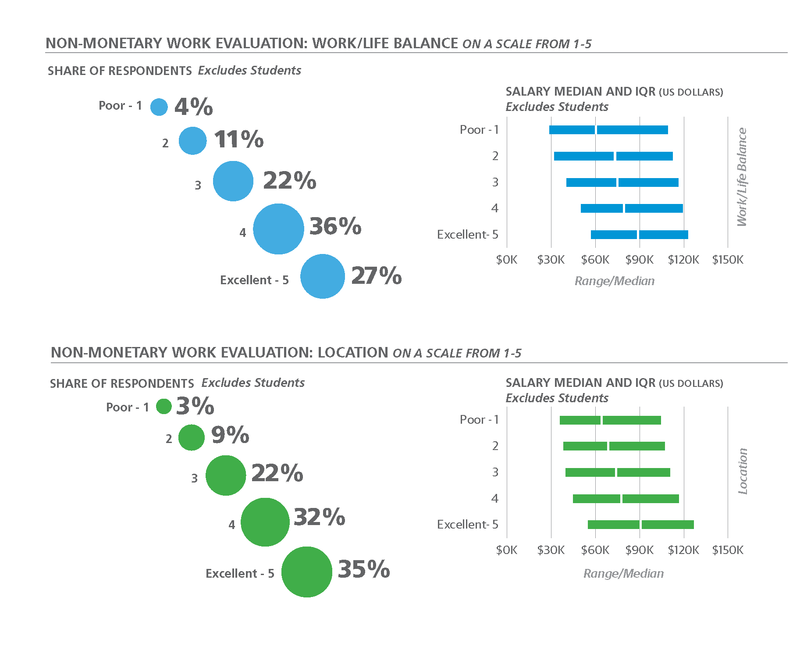 For a non-numerical perspective on salaries, we asked respondents to rate their satisfaction with their salaries. Despite the differences in salaries by country and region, about 50% of the non-student respondents were satisfied, 31% were neutral, leaving only about 20% unhappy with what they make. Students show a less happy picture, with 37% positive toward their salaries, 29% neutral, and 34% unhappy. The most unsatisfied student group seem justified in their gloom, with a median salary of just over $11K! CERTAIN REGIONS ARE OUTLIERS WHEN IT COMES TO SALARY. For example, within the US, the West Coast has a higher median salary than other parts of the country, likely due to the concentration of tech companies in the Silicon Valley area. California salaries are $15–$20K higher than any other part of the US, with a median of $139K. The northeast has the next highest salaries, with $124.5K median, and the Pacific Northwest follows at $120K median. These US regions are home to other big technology hubs: cities like New York and Boston in the Northeast, and companies like Amazon and Microsoft in the Northwest. The Midwest is the lowest-paid region of the United States (if you ignore “other”), but even it doesn’t do too badly. The median salary is almost $100K, and Texas alone is $106K. There is a stark difference between the US, with a median salary of $115K and the rest of the world. The next closest region, Australia/New Zealand, comes in nearly 22% less at $90K, Western Europe shows a median of $60K, and in Eastern Europe we see only $28K. Factors like the differences in cost of living, local demand for tech talent, respondent experience, and taxes help explain the wide range of salaries for developers. Some of the regional salary discrepancies could be caused by respondents incorrectly performing currency conversions, or doing no conversion at all. For example, reporting 30K British pounds as 30K USD would lower the averages. California salaries are $15–$20K higher than any other part of the US, with a median of $139K. OUR RESULTS SHOW THAT THE BIGGER THE COMPANY, THE HIGHER THE SALARY. About a third of our respondents (32%) worked for 2- to 100-person companies. Their median salary was $65K, which is $15K lower than our overall median. As companies grow, so do salaries: the median was $78K for companies with 101–1,000 employees, $91K for 1,001–10,000 employees, and a generous $103K for organizations with more than 10,000 employees. One-person organizations are an exception. Their $83K median salary falls between respondents from 101–1,000 employee firms ($78K) and 1,000– 10,000 employee firms ($91K). The small size of the one-person organization—a bit over 2% of respondents— may be focused on specialized work that commands higher pay. 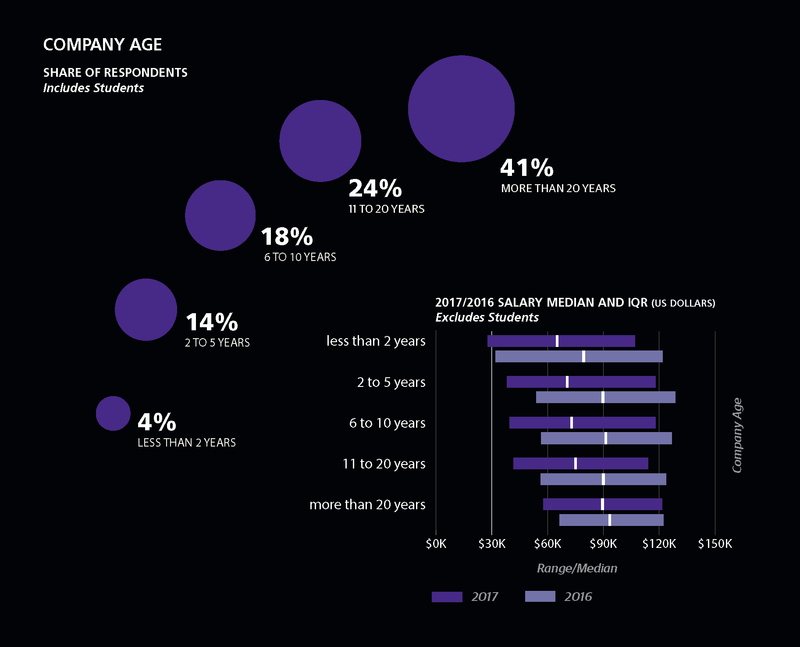 When we look at companies by age, we see a similar trend: the older the company, the higher the salaries. The majority of companies don’t make it to their fifth birthdays, which indicates that those that do are onto something. Older, more experienced companies probably also know that it is expensive to recruit and train new team members, so offering higher salaries to keep people can be worthwhile in the long run. 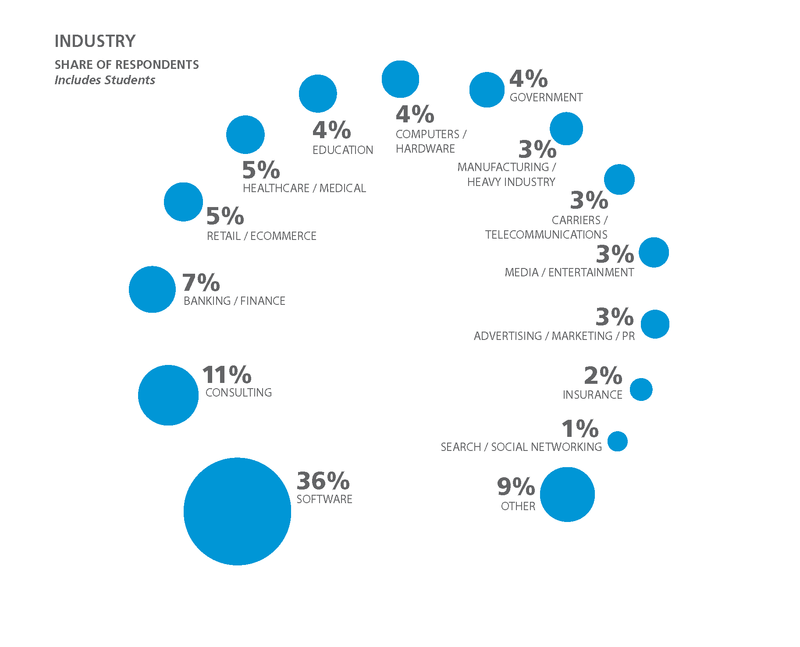 What specific industries do our respondents represent? It’s no surprise that Software is by far the largest category—36% of the respondents. 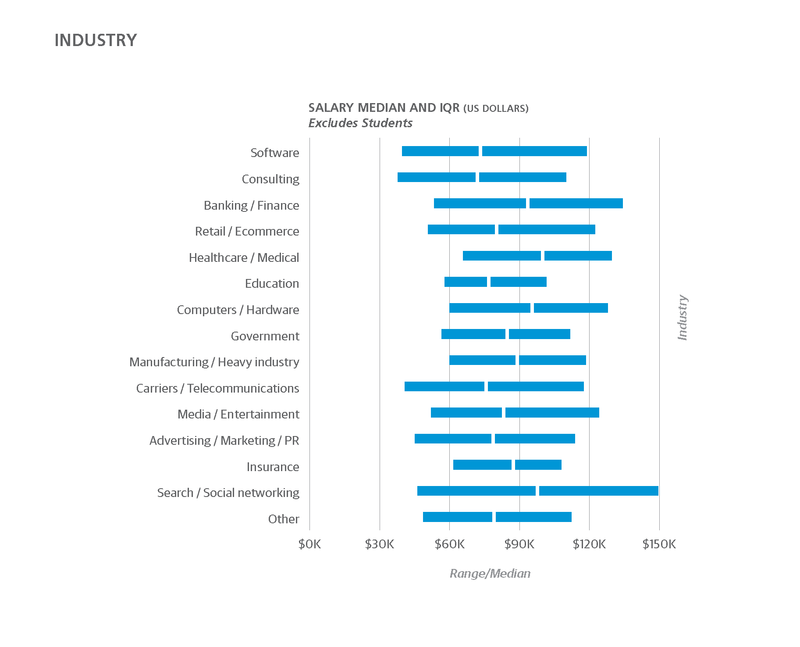 The Software industry’s median salary is $73K, $7,000 less than the overall survey average. 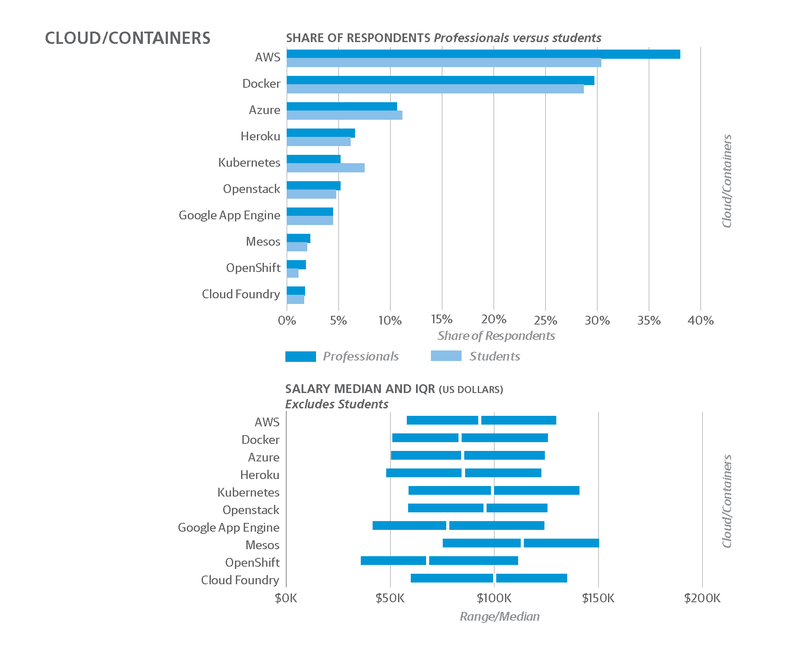 Aside from Consulting, which has a median salary of $72K, Software is actually the category with the lowest median salary. All the other industry segments had fewer respondents than Software, and showed higher median incomes, with the exception of Consulting. 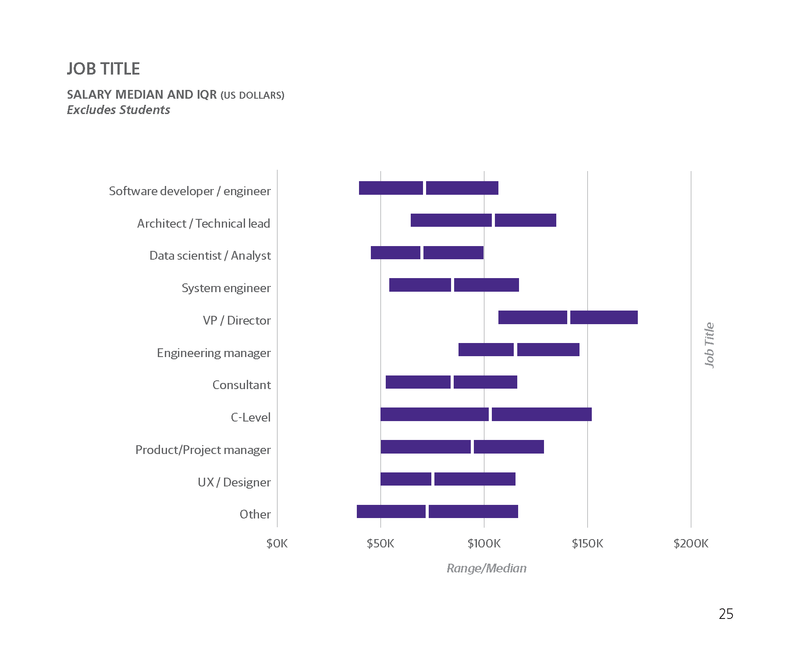 The results may show some selection bias: those working in the Software vertical likely have a wide range of experience levels working on similar types of tasks while also showing the widest range of salaries of any vertical ($36K to $119K). Those in other verticals (perhaps doing more specialized programming requiring more experience and/or education) can demand higher salaries. TEAM SIZE IS AN IMPORTANT FACTOR IN COMPENSATION. Generally, people on larger teams make higher salaries. One-person teams make around $69K median salary, whereas folks on 20+-person teams have a $99K median salary. This could simply be explained by the fact that, in order to have a large team, you need a larger company and, as we’ve seen, the larger the company, the higher the median salary. However, team sizes of one don’t necessarily mean small companies. 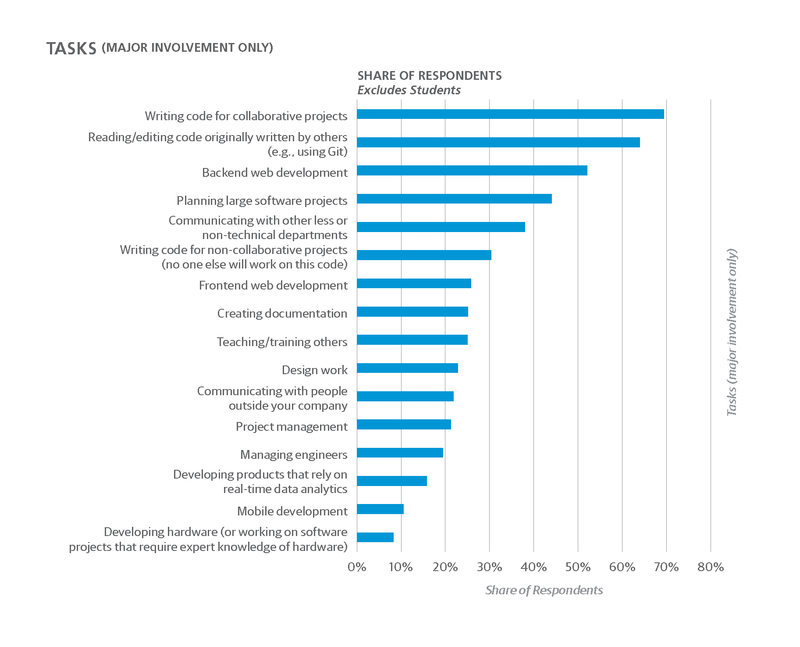 One-person and small teams could simply mean that these respondents are on small teams (or work by themselves) inside large companies that don’t have many programmers or are not in the Software industry. It seems that it is better to work with more people, at least in terms of salaries. As they say, a high tide raises all ships. Who you collaborate with doesn’t impact your salary, but not collaborating certainly hinders it. The 3% of respondents who worked solo and didn’t collaborate with people in any of the roles we listed in our survey (designers, programmers, data scientists/ analysts, product managers, and salespeople) earned a median salary of only $56K. We had over 425 female respondents—a large enough cohort to likely provide representative results. They represented 8% of survey participants. As we’ve noted, all salaries are down in 2017; however, women increased their relative salaries compared to the male respondents, from 86% to 92.5% of what their male counterparts earn. In the 2016 survey, women earned around $80K on average, whereas their male counterparts earned $93K. This year, women’s median salaries dropped to an average of $74K and men’s to $80K. There also appears to be an uptick in new women into the industry: over a third of the female respondents have less than 5 years’ experience, as compared to about 17% of men. If the trend keeps up and more women continue to enter the software industry, it will begin to redress the lopsided gender ratio. And as women move up the ranks, join larger companies, and gain more experience, hopefully their salaries will increase and close the pay gap. The age of the respondents skews youngish, with two thirds of respondents 40 or younger, 22% in the 41–50 range, and only 13% older than 50. It seems that salaries increase with age and experience. The over 50s were the only group to increase their salaries compared to 2016. While the over-50 group increased $2K, the 41–50 group lost around $5K in salary. The 31–40 group dropped from $90K to $76K, and the 30-and-younger group dropped from $64K to $51K. 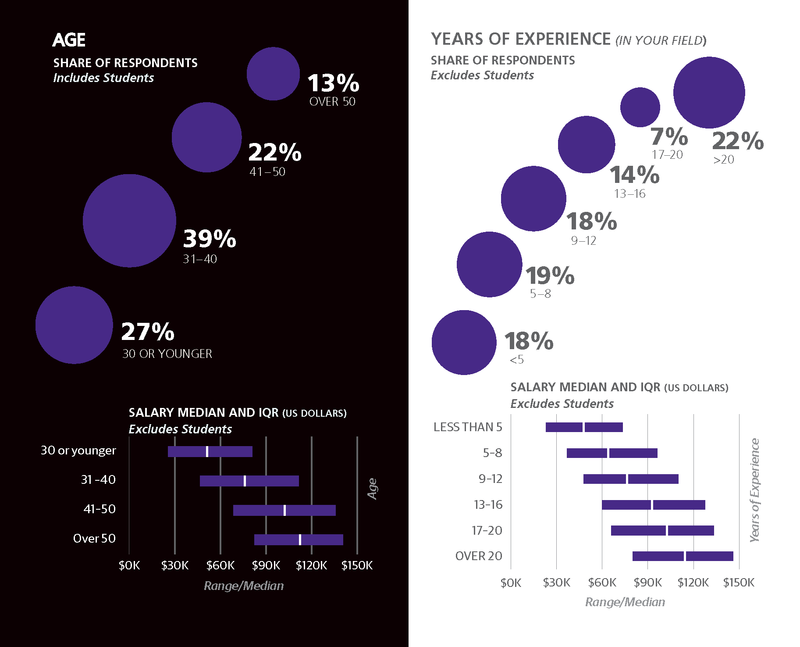 Across the board, the more experience you have, the higher the salary. On average, every year you work, you get a $4.4K pay raise. Respondents with less than 5 years’ experience had a median salary of $48K. At the other end of the spectrum, those with 20+ years’ experience had a median salary of $114K. A bit more than half of our respondents list computer science as their main degree, about the same as last year. 40% of participants have a master’s and about 6% have a PhD. This extra education appears to pay off: compared to those whose education stopped at the Baccalaureate level, respondents with master’s make about 18% higher salaries; for PhDs, the figure is 45% higher. While this is an impressive increase ($17K+ higher in salary for a PhD versus a master’s degree), is the extra time and expense of getting a PhD worth it? That depends on the type of work you’d most likely engage in. Folks with advanced degrees likely work on more specialized, cutting-edge challenges. These jobs are usually in high demand and therefore offer higher pay, which helps offset student loans. 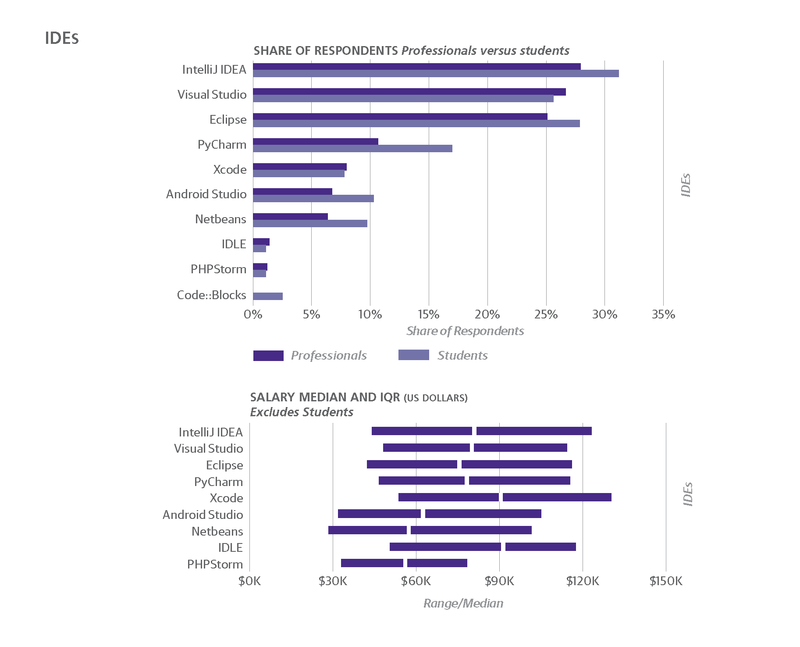 It seems strange that people in Consultant and UX/Design roles make more than software developers/engineers. This is probably due to the small number of respondents in these roles. Given more respondents, there would be a broader spectrum of possible salaries, and more companies and tasks represented, which would give us a better picture of the real salary levels. As we move up the hierarchy, those with C-level titles (CTO, CIO, etc.) 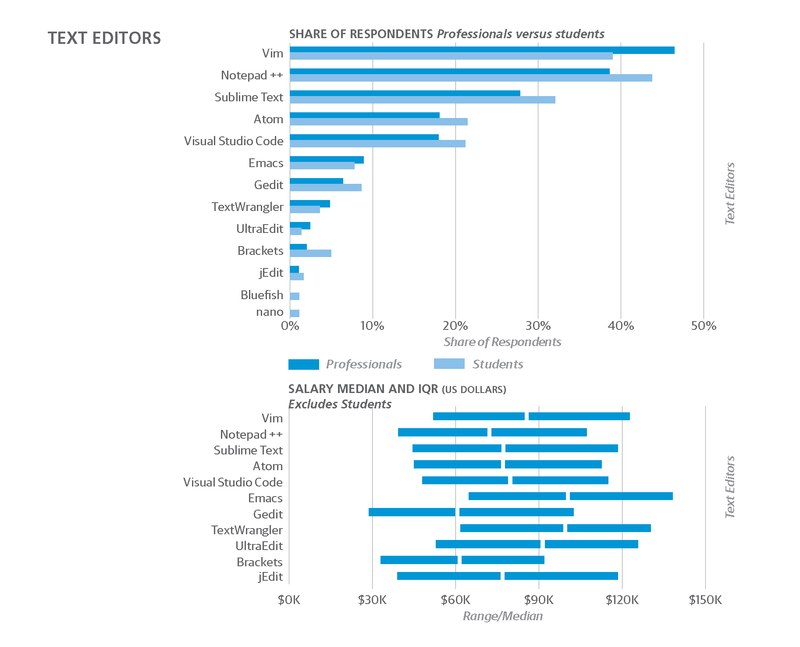 are paid a median salary of $102K, architect/technical leads make around $104K, and VPs/directors earn around $140K. 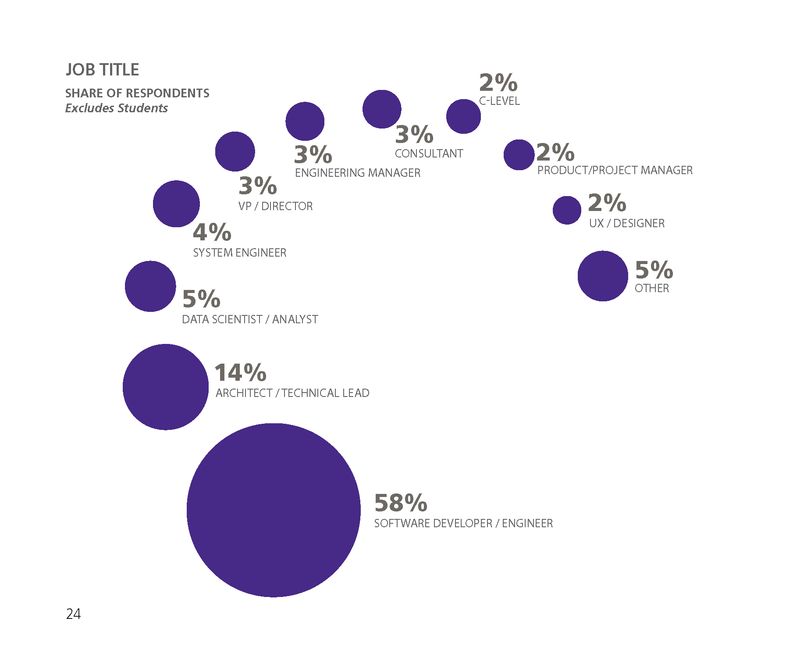 Software engineer/developer was the role the largest percentage of students identified as. 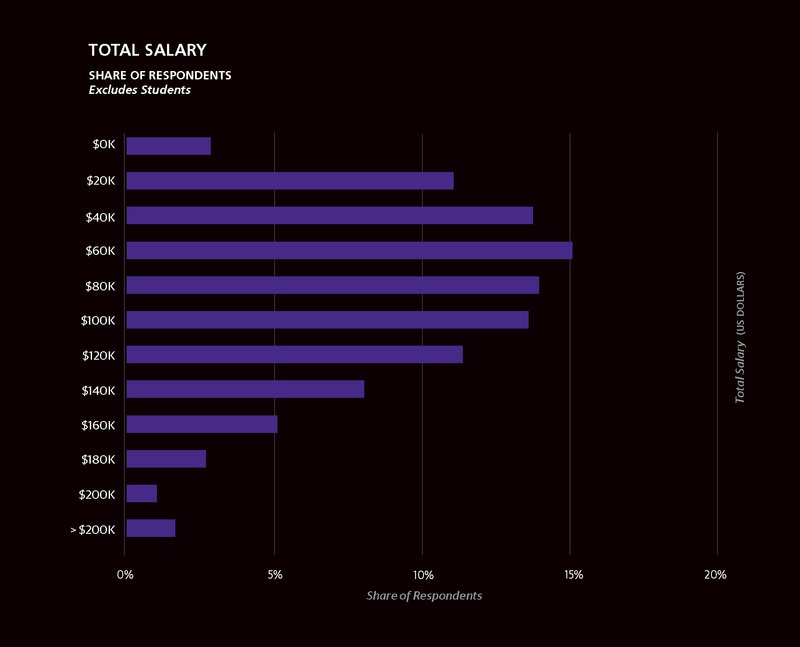 Their median salary was $35K, half what their non-student counterparts are paid. Not surprisingly, there were no VP or C-level respondents in the student group, and only 6% listed themselves a technical lead (compared to 14% of non-students). 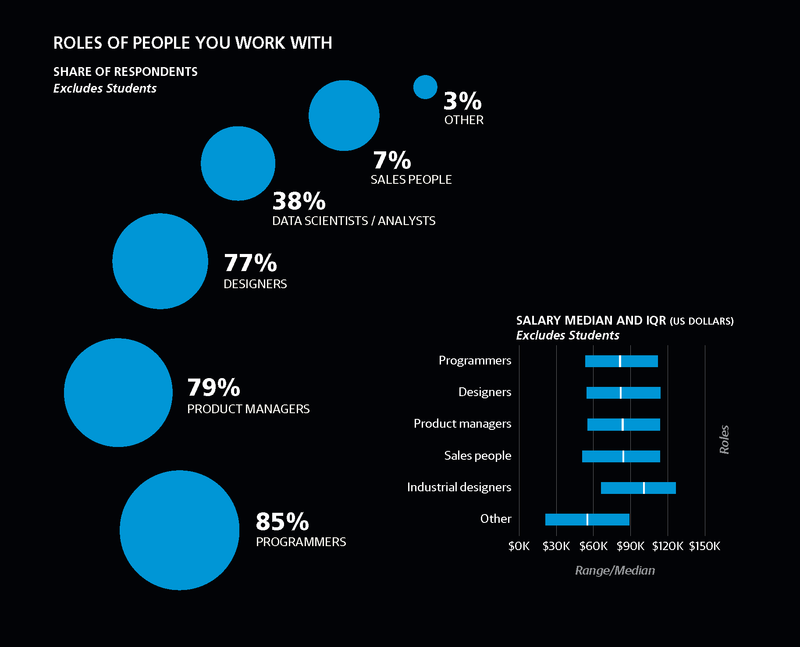 It seems strange that people in Consultant and UX/Design roles make more than software developers/engineers. A lucky 3% of respondents don’t attend meetings, whereas the largest share of respondents (43%) attend 4–8 hours of meetings a week. This may seem like a lot, but if they are using the Agile methodology, they probably have a 15- to 30-minute stand-up each day. Four days of that adds up to 2 hours a week; throw in a 1-hour planning meeting or retrospective and you’re getting close to 4 hours. An unlucky 3.5% of respondents spend more than half their work week—20 or more hours—in meetings. Somewhat counterintuitively, the more time you spend in meetings (and presumably not actually producing output), the higher your salary. This doesn’t mean you should go and book yourself into every optional meeting you can; there is probably an underlying factor, such as responsibility level, which affects both salary and time spent in meetings. For example, C-level respondents are likely to spend a lot of time in meetings, working long hours, and making difficult decisions, and they are compensated accordingly. So it isn’t necessarily the hours spent in meetings that affect the salary, but probably the level of responsibility that determines the number of meetings. 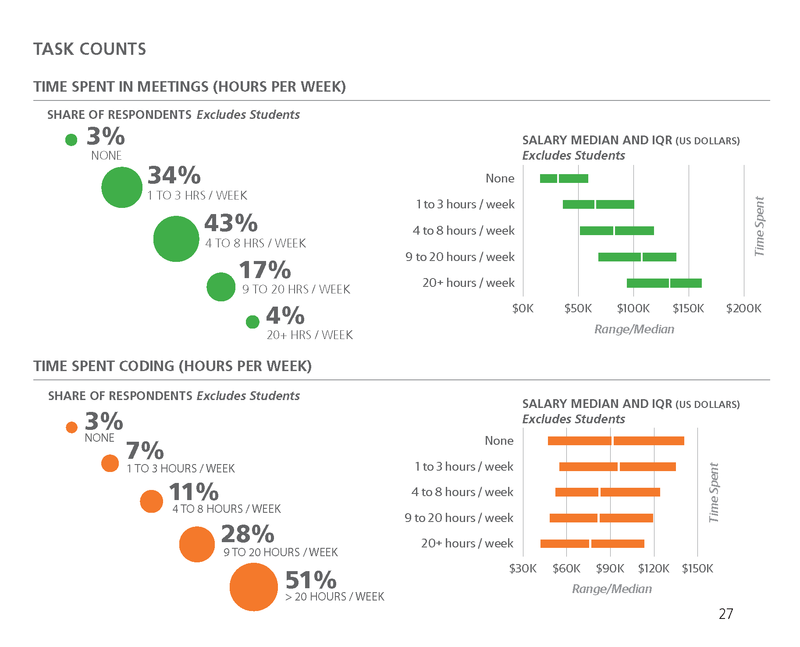 The findings regarding meetings aligns with what we’ve found in all O’Reilly salary surveys to date: time spent in meetings serves as a reliable proxy for the increased responsibility that comes with the type of leadership, planning, and management roles associated with higher salaries. Somewhat counterintuitively, the more time you spend in meetings (and presumably not actually producing output), the higher your salary. 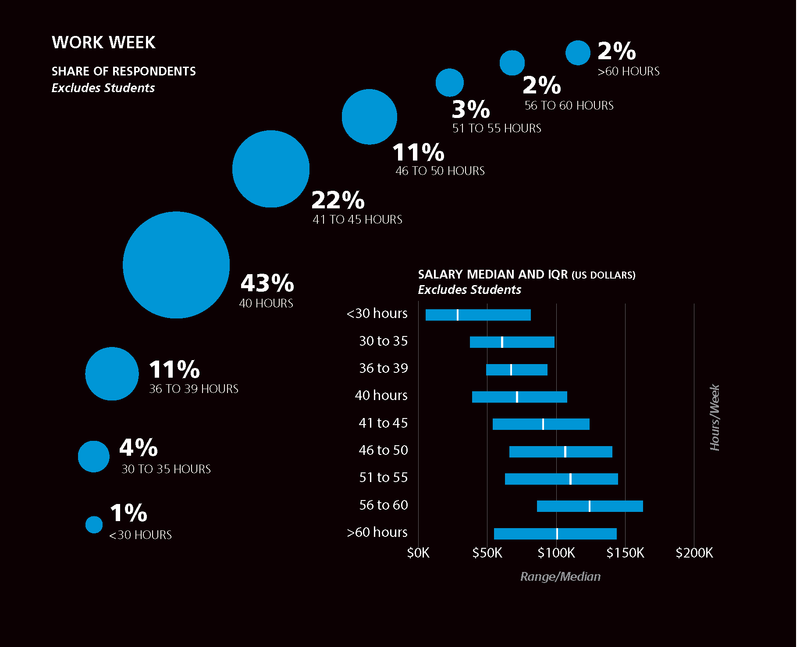 The survey data shows that more hours spent per week coding correlates with lower salaries. Similar to what we find with meetings, junior coders and those in less-responsible positions (and positions with fewer non-programming duties) spend more time programming than those who don’t. 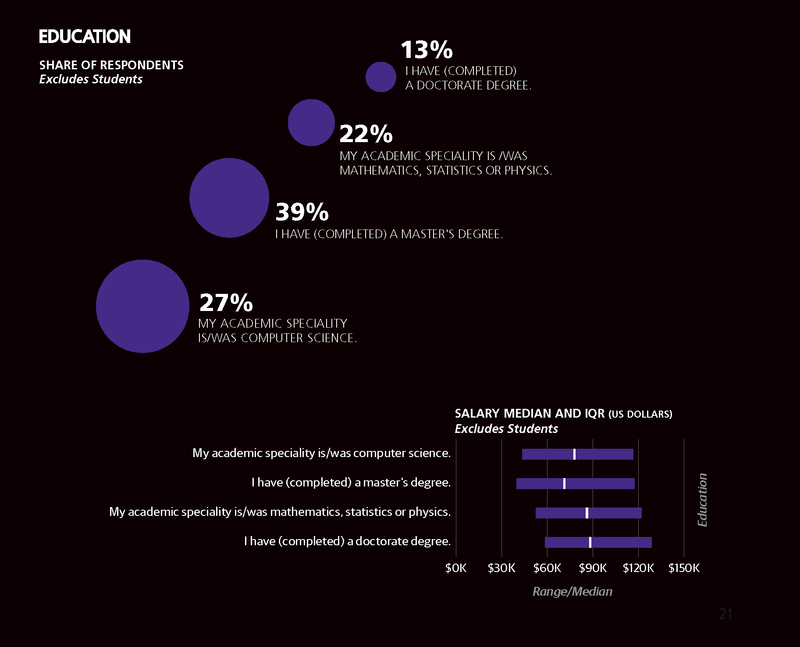 This trend applies to students and non-students alike: more time coding means lower salary. The type of tasks you perform can have a big impact on your salary. Depending on your tasks, you might make a whopping $130K or more a year. “Developing products that rely on real-time data analytics” is the highest paid task that is independent of seniority. The 16% of respondents who listed this task among their duties earn a median salary of around $96K and the top 25% of those respondents had salaries greater than $134K. As mentioned earlier, the vast majority of respondents are software developers/engineers, so it’s no surprise that 69% of respondents say they “Write code for collaborative projects.” This garners a median salary of around $81K, slightly more than the overall median salary (excluding students). 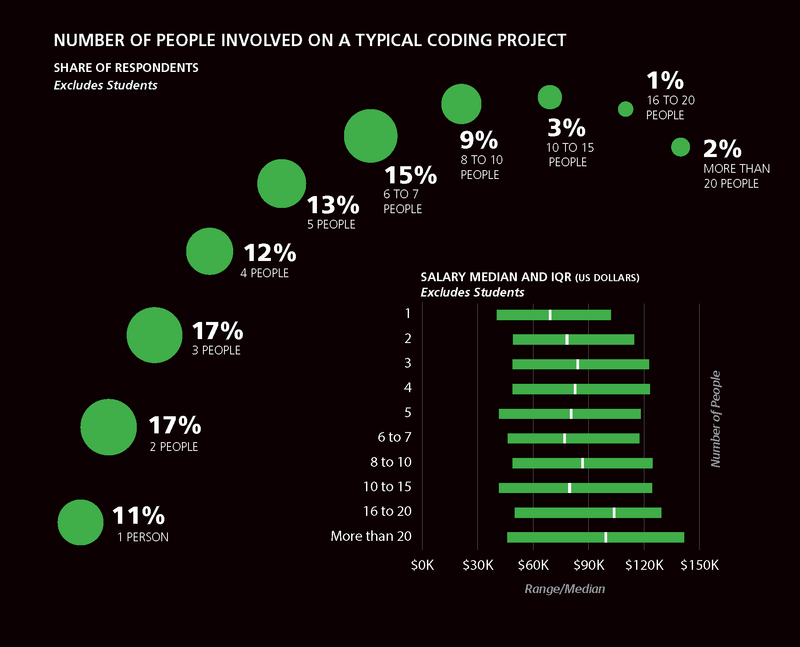 For comparison, writing code for collaborative projects earned a student a $41K median salary. When we look at all the other tasks noted, there are a few standouts. 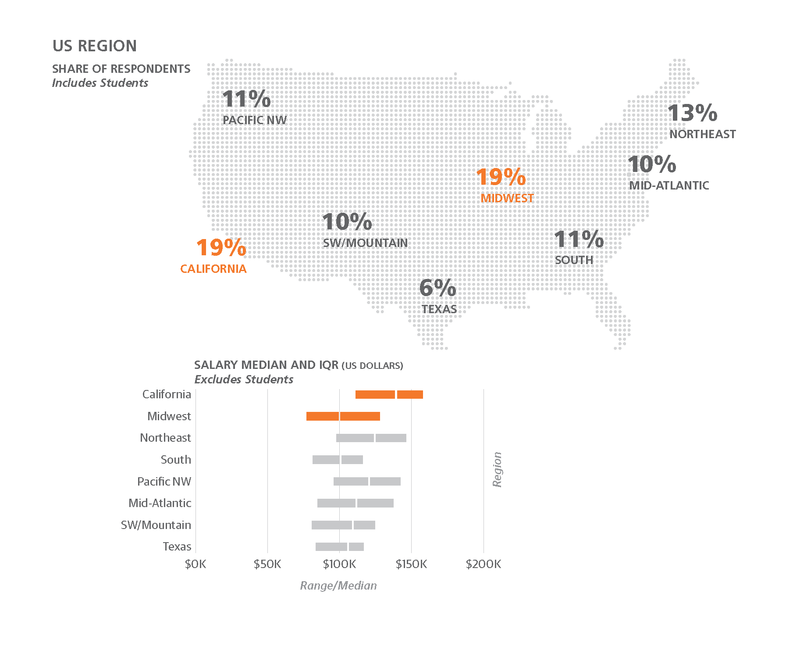 Design work is performed by around 23% of the respondents; their median salary was $100K. 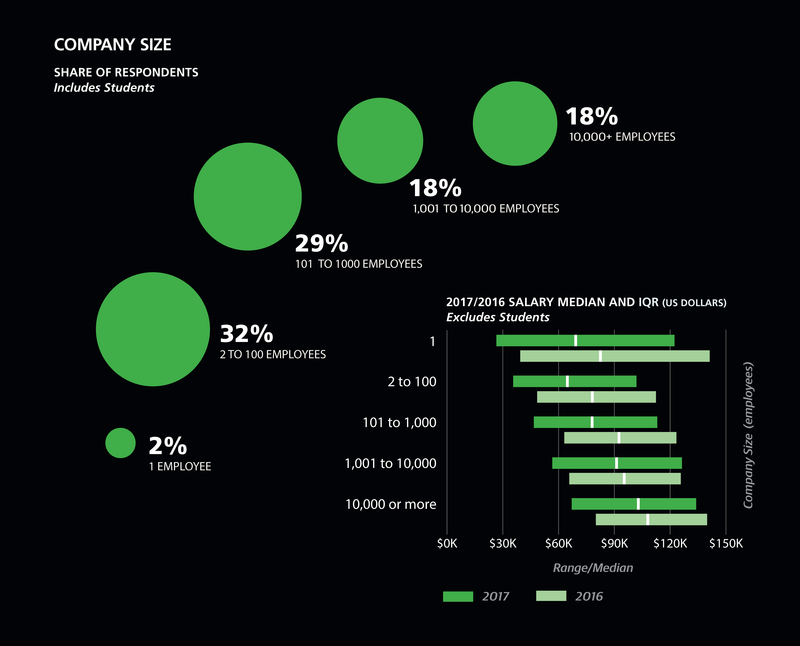 12% of students said they engage in design work; their median salary was $60K, one of the highest salaries by task type for students. This could show that companies are willing to pay more for multi-talented people who can code, design, and handle other responsibilities. Planning large projects, performing project management, and managing engineers were tasks listed by respondents who earned some of the highest salaries. These tasks are associated with more senior-level positions with more responsibilities, so the increased salaries make sense. 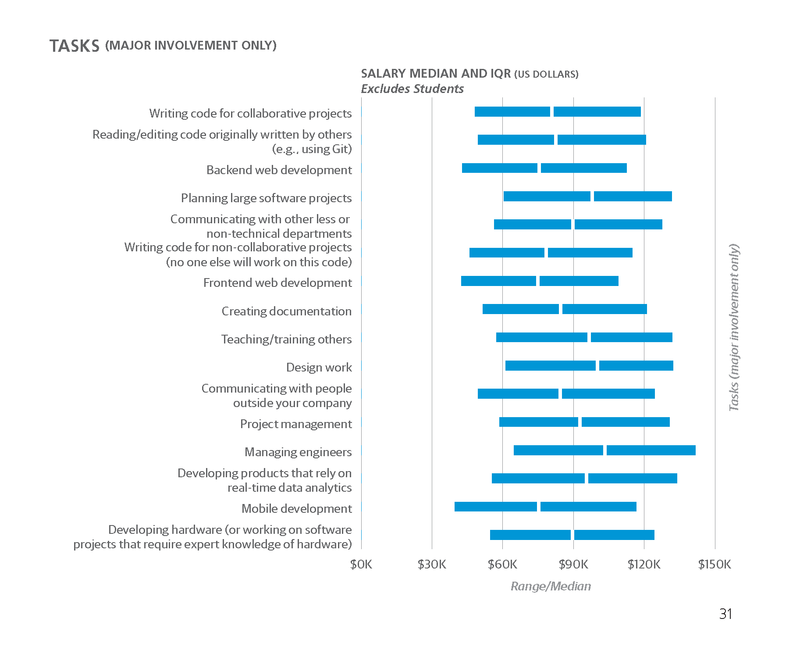 Planning large projects, performing project management, and managing engineers were tasks listed by respondents who earned some of the highest salaries. NEW TOOLS ARE ALWAYS APPEARING and others maturing and disappearing. Knowing what operating systems, programming languages, text editors, IDEs, data tools, build tools, cloud containers, and frameworks that people are using allows us to see trends in the industry. These charts include both student and non-student responses. It is interesting to see which tools the next generation of programmers are familiar with and which will potentially need to be learned on the job. Our results show that programming languages, operating systems, and platforms sometimes trend together. For instance, Objective-C is being replaced by Swift in the future programming languages category. We saw Objective-C drop 2% in popularity compared to last year’s survey and Swift make its first appearance on the list, coming in fourth at 15%. In the OS category, macOS usage dropped almost 8% compared to last year’s survey. Similarly, iOS development dropped a percentage point (from 11% to 10%), but Xcode use increased 6%. There are now more Android developers than last year (12% versus 11%). Android Studio made its first appearance as an IDE this year, with 7% of our respondents using it. Java holds strong as a popular programming language (36%) and as a past and future programming language (24% and 7%, respectively). While Android is written mainly in Java, Google’s other programming language, Go, is also a hot topic. Only about 4.5% of the respondents say they use Go, while less than 2% say they’ve used it in the past, but it’s a new language, so this is understandable. 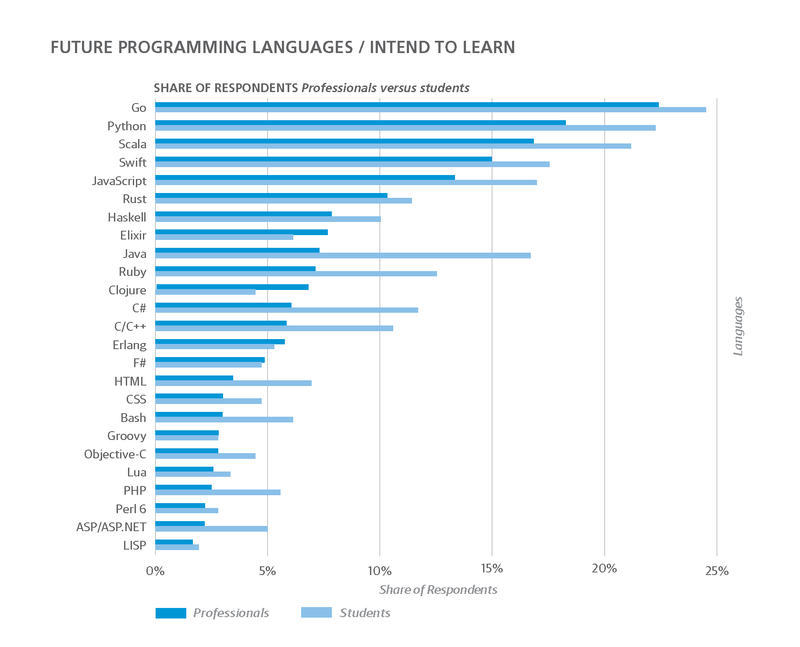 Go ranks first among future programming languages, with 23% of the respondents wanting to learn it. When we look at the 2016 survey results, we see a similar number: Go was also the highest ranked programming language to learn (23%). Many want to learn Go, but people either don’t seem to have the time or Go isn’t being adopted enough within companies for folks to learn it on the job or for everyday tasks. Microsoft has made some big announcements in the last 12 months. From new hardware, to more open source offerings, to software updates, they are definitely a company to watch. So how has that affected usage? The percentage of people using Windows has held steady at 62% over the last two years. However, Microsoft’s main programming languages— C#, ASP.net, and VB.net—have seen a decline in their everyday usage (2%, 3%, and 2%, respectively). In terms of languages that people want to learn, C# has seen a slight 1% increase, Visual Studio IDE is down slightly (2%), and their cloud platform Azure is up 1%. The top three programming languages our respondents have used professionally in the past haven’t changed much over the last year. C/C++ (35%), Java (24%), and PHP (21%) dominate the top of the list, just like last year. 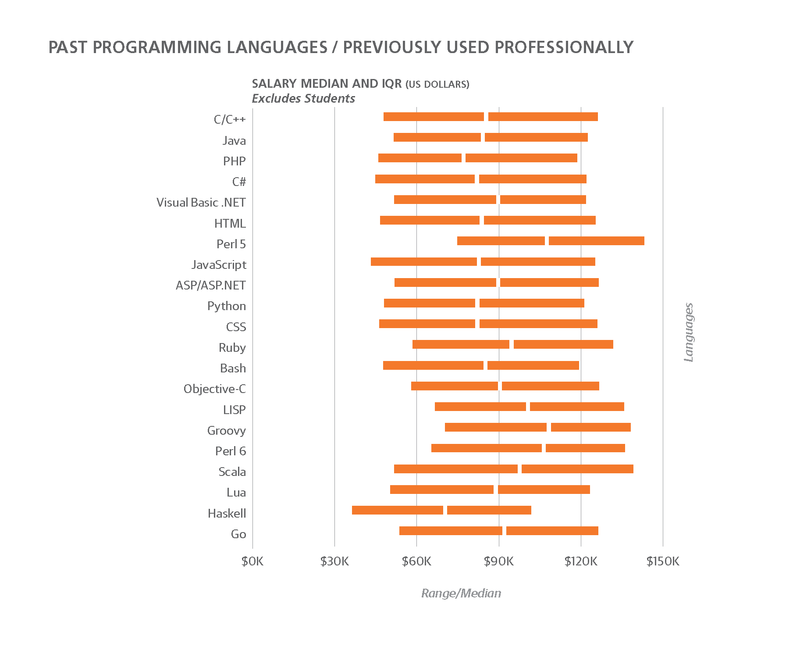 The popularity of a programming language is not a good predictor of salary, which makes sense: sometimes obscure languages are in demand for specific applications and the few people who know those languages can make a lot of money. Other languages are widely known, but since they are also widely used in many different applications, they pay well. C/ C++, for example, garners a median salary of $85K—higher than our average. Perl 5, Perl 6, and Groovy all have well-paid median salaries ($110K), with the top 25% of respondents who used these languages making more than $130K. Student responses about past programming languages are interesting because these are folks who will be entering the workforce. What they are taught at school and what they are learning on their own can be an indicator of what’s to come. 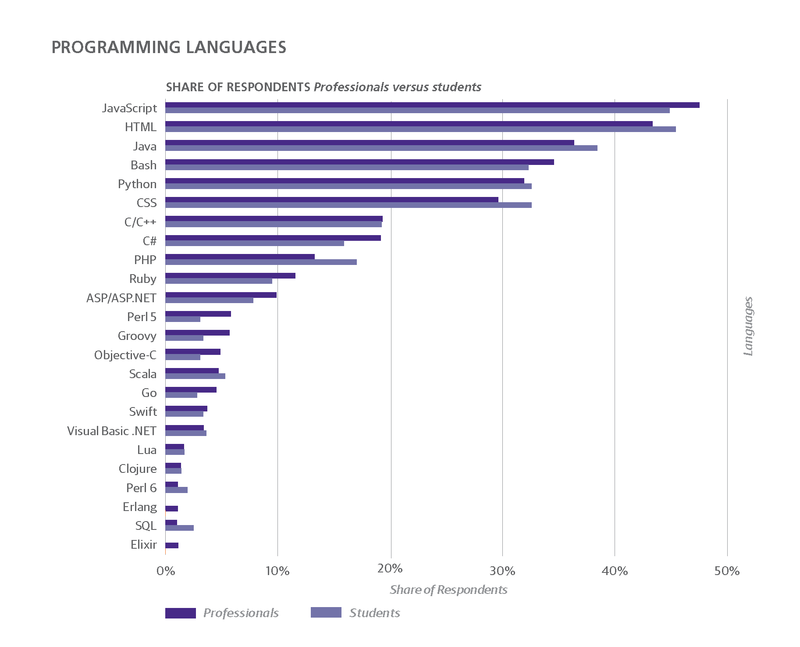 C/C++ dominates the top spot, just as with non-students, with C# coming in second at 22%. This is important because, for non-students, C# is fourth at 17%. Only 20% of students have used Java, compared to 24% of non-students. 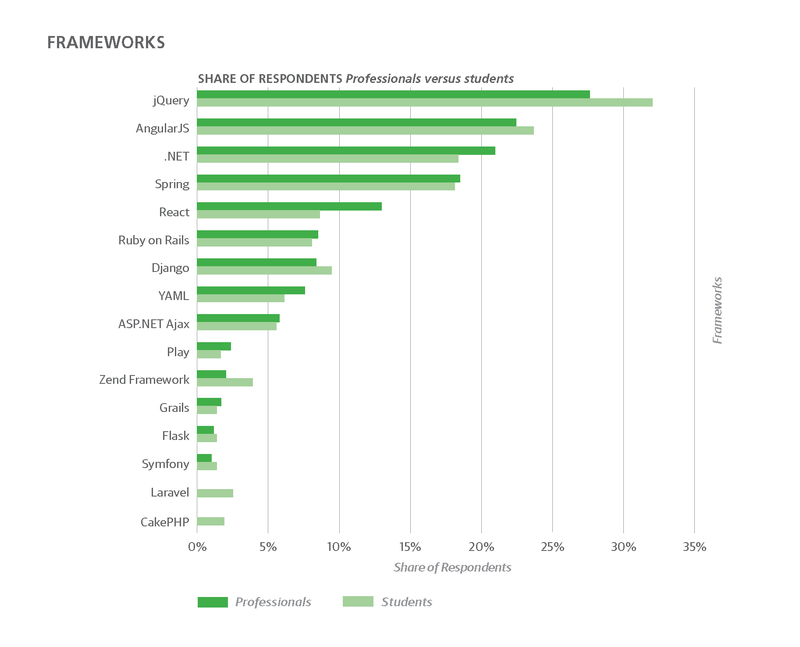 These are interesting indicators that students are being taught more C# and less Java. In the near future, we might see a need for more Java training and/or a rise in C# programming. 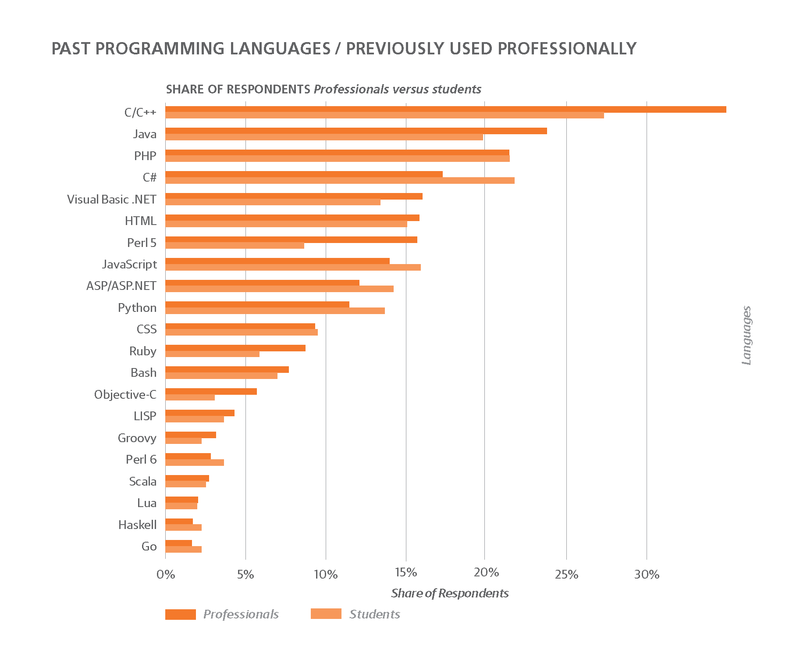 2.5% of students are familiar with Swift, Apple’s new programming language, but Swift is not on the list for non-students. Go is also interesting in that 3% of the students have some experience with it, whereas only 1.6% of the non-students do. Since both of these languages are fairly new, it’s understandable that students have more exposure to them, and more time to experiment with and learn them. Non-students might have less free time and be required to use languages their employers have chosen. For students, Java, PHP, and C/C++ are highly desirable, too, which makes sense because those are the languages being used in companies, so knowing them can help students enter the workforce. 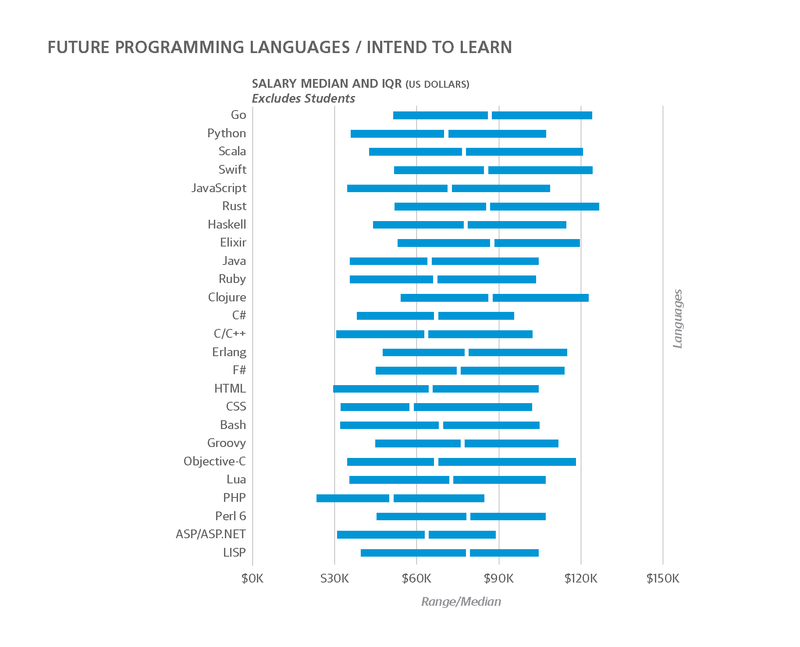 For non-students, Rust, Haskell, and Elixir are also high on the list of languages they want to learn. A CAREER IS SO MUCH MORE THAN JUST WORK AND PAY. This year’s survey contained several subjective questions that were meant to capture how respondents felt about their jobs. It turns out you don’t always have to make sacrifices to get better pay. Respondents who are happier with their situations and have better work/life balance also have better salaries. You don’t have to be miserable to be paid well. Respondents were asked to rate, on a scale from 1 to 5 (1 = poor, 5 = excellent), how easy it would be to find a new job more or less equivalent to their current position. This was used to gauge how well people could move laterally through companies. 64% of respondents were positive (4 or 5) that they could move with ease. The students also shared this high level of optimism, with 60% answering positively. Our respondents were less confident about negotiating and bargaining for a better salary or perks. When asked about their bargaining skills, 38% answered 3 (not bad but not great), 34% responded positively (4 or 5), and 28% felt they lacked these skills (1 or 2). When we look at just the self-assessed better bargainers (those who responded 4 or 5), we see that they do indeed have much better salaries than other respondents. The best self-assessed bargainers, those who responded 5, were earning around $107K, whereas those who responded 3, had salaries nearly $38K lower! This data suggests that perhaps the best way to improve your salary is to spend time (and maybe even money) becoming a better bargainer. If we dig a bit deeper into some of the non-salary aspects of a job—such as flexibility, work/life balance, location, growth opportunities, and company culture—we see a striking increase in salary as people rate these categories higher. This year’s survey contained several subjective questions that were meant to capture how respondents felt about their jobs. 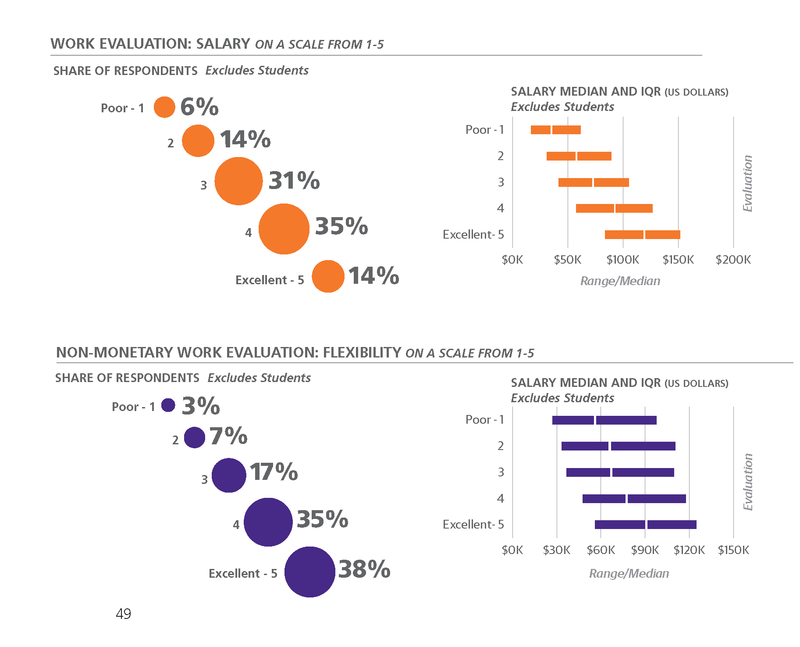 The vast majority of people are very positive toward their work flexibility: 73% responded with a 4 or 5, and their median salaries were $77K and $91K, respectively. Only 9% had a negative view of their work flexibility (1 or 2) and their salaries were $56K and $66K, respectively. The disparity between the lowest and highest median salaries based on flexibility is around $35K. This is the largest difference in any of the Work Evaluation categories. It seems that flexible companies also pay their employees well, so you likely don’t have to sacrifice income for flexibility. When it comes to work/life balance, 22% of the respondents were neutral (3), whereas 63% see themselves as having a positive work/life balance (4 or 5). Companies that allow for good work/life balance also tend to offer better salaries. The median salary of those who think their work/life balance is poor (1) was $60K, whereas those who rated their work/life balance as excellent (5) had a median salary of $91K. 67% of the respondents feel positive about the location of their current roles (4 or 5). This might be a self-fulling system: if a company’s location is too far away from home or the work environment is not good, it’s unlikely that employees will work there for long. By taking a job at a company with a better location, you’d naturally rate it higher. So it makes sense that this data point would be positive simply because people will self-correct away from being negative. There’s a small trend in salaries increasing with location satisfaction. 30% of the respondents were neutral (3) about their opportunities for growth. 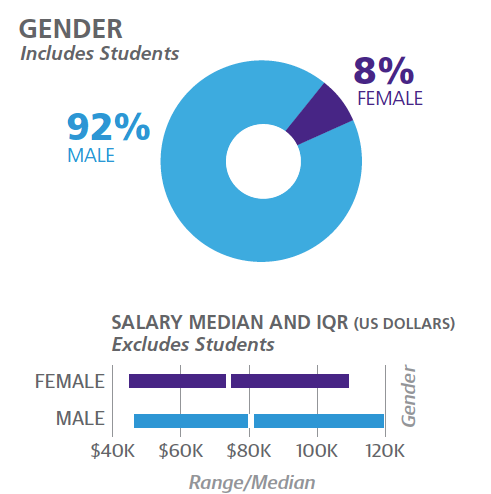 Their median salary was around $82K, slightly higher than the overall median salary of $80K for all respondents. 42% of the respondents have a positive view toward growth opportunities (4 or 5). They have salaries ranging from $81K to $90K. There is a $28K difference in median salaries between those who rated their growth opportunities as poor (1)—10% of respondents at $72K—and those who rated them excellent (5)—14% at $90K. Salaries also increased with better company culture. The median salary difference between respondents who chose the lowest rating (1) and those who chose the highest rating (5) is $15K. In general, respondents were happy with their company culture: only 20% rated it negatively (1 or 2), whereas 52% had positive views of it (4 or 5). It certainly does seem that you can have your cake and eat it too. Companies who respect their employees both pay them well and create a positive place to work. Maybe companies realize that getting and keeping great talent is expensive, but cheaper than constantly trying to find new talent. THE SURVEY ASKED RESPONDENTS IF THEY ENGAGED IN ANY SPECIFIC CAREER-DEVELOPMENT ACTIVITIES: reading books and blogs, watching videos, taking online classes, and attending conferences. It turns out that none of these activities affected salary in any substantial way. 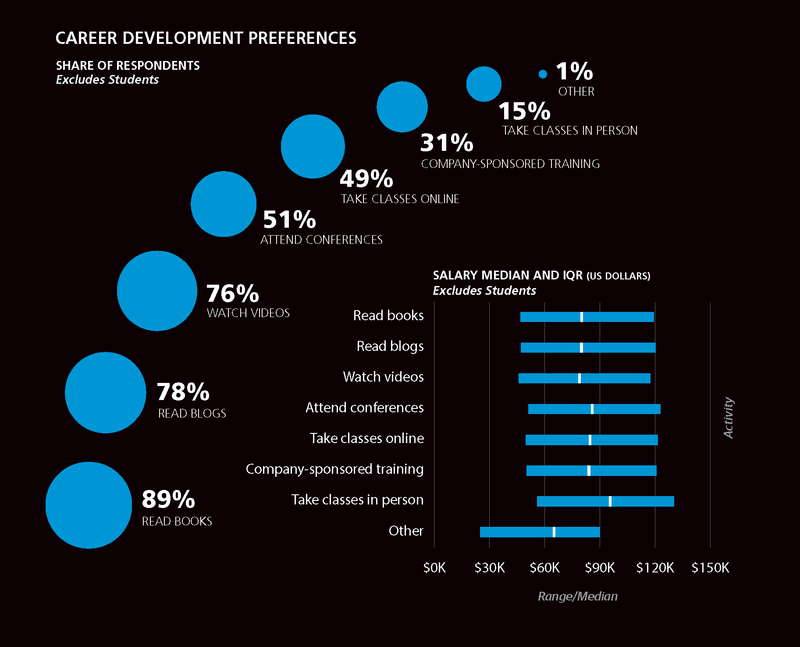 The median salary was around $80K for the respondents in each of the preferred career-development options. The only two exceptions were “None of the above,” which had a detrimental effect on salaries, dropping them to $65K, and “Taking Classes in-person,” which raised the median salary to $95K. While the salaries might be similar for the different activities, what activities are chosen varies greatly. The most popular was reading books (89%), followed by reading blogs (78%). O’Reilly Media sells a lot of books, so it isn’t a surprise that reading is high on the list, but O’Reilly also hosts conferences across many different disciplines. About half of our respondents said they attend conferences as a way to improve their careers. Roughly the same amount said they take online classes, whereas about 3 out of 4 respondents said they use videos as a source of information. Lower down the preferred list are company-sponsored trainings (31%) and in-person classes (15%). Respondents who prefer to take in-person classes tended to have a higher median salary (around $95K) than any of the other career-development options. This probably has less to do with the classes themselves and more to do with these people’s positions within their companies. Taking time off to attend conferences— or finding the time to watch videos, read books, and read blogs—can be difficult with a busy schedule, so being instructed to attend an in-person class might be the most viable option. THE MODEL HAS R2 OF 0.587: this means the model explains approximately 59% of the variation in the sample salaries. The intercept has been combined with the geographical coefficients, of which you select one. You then proceed through the coefficients, adding or subtracting the ones associated with a feature that applies to you. Once you sum up the coefficients, you will obtain the model’s estimate for your annual total salary in US dollars. THIS SECOND ANNUAL SOFTWARE DEVELOPER SALARY SURVEY garnered over 6,800 responses this year, up from 5,000 responses in 2016. While we did see a drop in median salaries compared to last year, we also noted big changes in the demographics of the respondents that may help explain those declines. However, many of the trends and percentage shares we observed last year held this year, giving us confidence in the stability of the survey as a measurement tool. The software development survey is an open, self-selecting survey. Respondents may not be representative of the industry as a whole, likely reflecting the inherent biases of those familiar with O’Reilly and engaged in some way with the content and events that O’Reilly produces. Keep that bias in mind when reviewing the results. If the survey results have little in common with your own work/life experience, it’s more likely that the survey did not capture your situation rather than your situation being abnormal. When looking at the charts, tables, and results, remember the data is all interconnected. Try not to focus on or optimize for any one attribute. 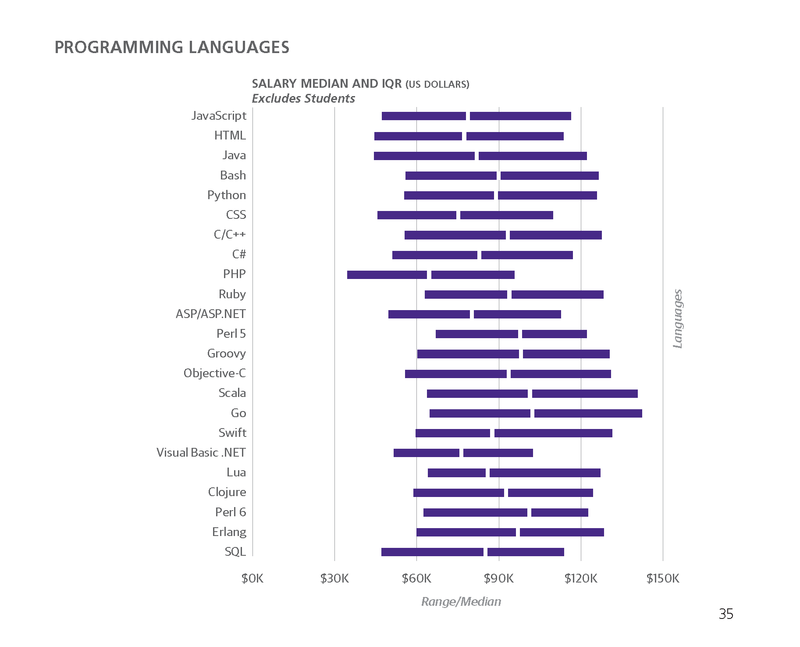 If C++ programmers make a higher salary than others, simply learning that language is unlikely to lead to higher pay. The C++ programmers in the survey may have more experience, work for larger companies, have higher degrees, or work in a different industry than you do. Use the survey results as a starting point for thinking about your own career and what path (i.e., what skills, locations, roles, and responsibilities) might work best for your goals and aspirations. Also, keep in mind that causation doesn’t mean correlation. For example, attending more meetings, while correlated with higher pay, is not likely to increase your salary. Focus instead on gaining the responsibilities and roles associated with those who attend more meetings to advance. This goes for everything in the survey, programming languages, company size, industry, and so on. The survey aims to provide information you can use to make well-informed decisions regarding your career by helping you better understand your own situation in the context of the larger software development community. You can address what you find most important to you, including tool choices, work methods, culture, and compensation. We hope the perspectives offered by the survey can assist you in such endeavors. Article image: Battle of Lights, Coney Island, Mardi Gras - Joseph Stella (source: Yale University Art Gallery). Brian Suda is an informatician currently residing in Reykjavík, Iceland. He has spent a good portion of each day connected to Internet after discovering it back in the mid 90s. His own little patch of Internet can be found at suda.co.uk where many of his past projects and crazy ideas can be found.